A grizzly and cold November morning. Detective Sergeant Kate Linton is called on Glastonbury Tor where a young woman has been strangled. Twelve holes are found at the scene, surrounded by wax, evidence of garden flares – the only connection to two other unsolved cases. When another young woman and a TV celebrity go missing, Linton is in a race against time to find the serial killer before he strikes again. But, when her journalist ex-boyfriend is singled out as a chief suspect, Linton feels that events are heading a bit too close to home. A Means of Escape presents an intricate, gripping mystery plot, combined with a focus on the heroine’s personal life as she juggles an unwelcome attraction for her good-looking and charismatic superior with her efforts to become closer to her estranged family. A Means of Escape is the first in a series of psychologically driven crime novels. 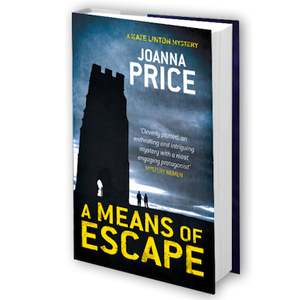 A Means of Escape is the first book in the series of mysteries featuring a gutsy new heroine in a one-of-a-kind location.